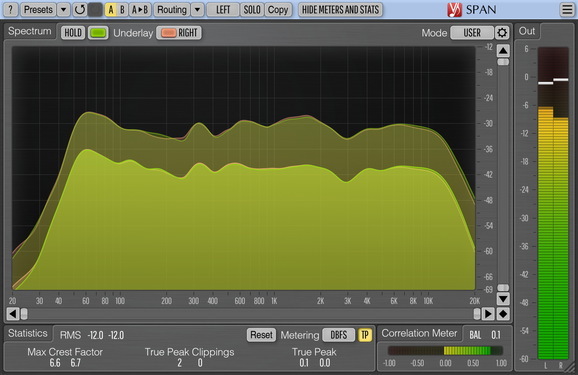 SPAN is a free real-time “fast Fourier transform” audio spectrum analyzer AU, AAX and VST plugin for professional music and audio production applications. For the most part it was derived from Voxengo GlissEQ dynamic parametric equalizer and reproduces its spectrum analysis functionality. SPAN provides you with a very flexible “mode” system which you can use to setup your spectrum analyzer preferences. You may specify Fourier block size in samples, FFT window overlap percentage, spectrum's visual slope. Beside that you can choose to display secondary spectrum of a desired type (e.g. real-time maximum, all-time maximum). Spectrum can be smoothed out visually for an easier examination. SPAN supports multi-channel analysis and can be set to display spectrums from two different channels or channel groups at the same time. Spectrum's color can be chosen to taste. SPAN also features output level metering with adjustable ballistics and integration time, K-system metering (including calibration K-system metering). SPAN displays level metering statistics, headroom estimation and clipping detection. Correlation metering is available as well. A compliment is exaggeration with true core. Ein Kompliment ist Übertreiung mit wahrem Kern.